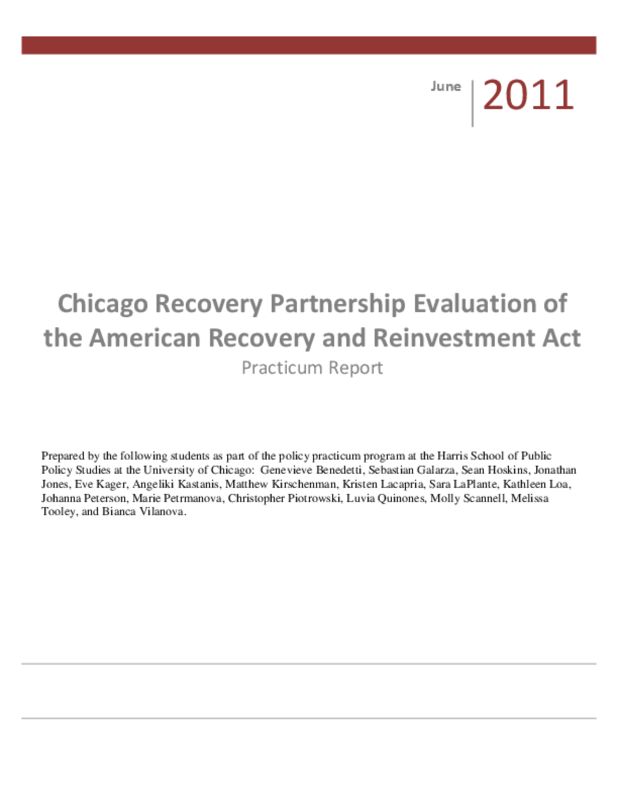 From 2009-2011, the City of Chicago and Cook County received a total of $2.35 billion in funding provided by the American Recovery and Reinvestment Act [ARRA]. The stimulus money was allocated to seven areas: education, basic needs, transportation and infrastructure, housing and energy, public safety, broadband and workforce development. The Chicago Recovery Partnership Evaluation of ARRA analyzes the impact of the stimulus spending using a costbenefit analysis framework. This report evaluated $1.09 billion of total spending in Chicago and Cook County, resulting in net benefits ranging from -$173.9 to $2,740.2 million. The wide range in net benefits is attributed largely to education, which received over half of ARRA funding.